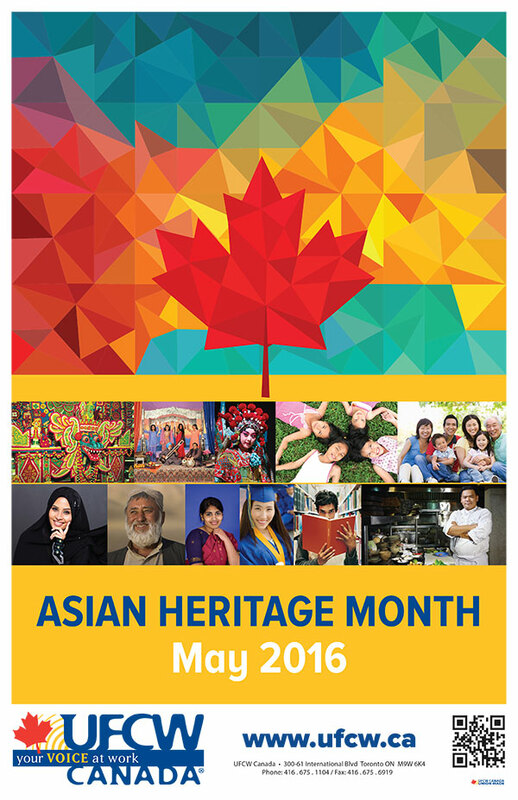 Toronto – April 30, 2016 – Every year during the month of May, Canadians have the privilege of celebrating Asian Heritage Month. From coast to coast, citizens have an opportunity to learn about the rich and exceptionally diverse histories of our large and growing Asian communities. With over 15% of Canadians identifying as being of Asian descent and almost 57% of immigrants arriving between 2006 and 2011 from Asia, the Asian continent is the single largest source of immigrants to Canada. Unfortunately however, Asian communities have experienced varying levels of racism. Whether it be the 1914 events relating to the Komagata Maru, or the exploitation Chinese workers who helped build Canada’s national railway, or contemporary issues of Islamaphobia or discrimination in the workplace, Asian History Month is clearly an opportunity work towards the eradication of such barriers. While May remains an important month to reflect, for several years UFCW Canada has been taking concrete steps throughout the year to ensure that we are increasingly representative of UFCW Canada members from Asia and that our workplace cultures remain inclusive. Across Canada, many UFCW Canada local unions engage in meaningful ways with Asian and South Asian communities through community and union events. For instance, Locals 175 and 633 in Mississauga, Ontario annually celebrate Family Day which includes a Chinese Lunar New Year Celebration with a special event at their union offices with members and staff. In 2015, UFCW Canada embarked upon a national multiyear Strategic Diversity and Inclusion Initiative which is transforming our great union from the inside. Through this training we are planting the seeds and building a foundation for transformational organizational change. As one of the largest union educational initiatives in Canada, all of our local and national staff, presidents, and leaders actively participate in the annual two-day training to learn about how unconscious bias plays a role in our everyday decisions. From whom we hire, to how we represent our most important responsibility – UFCW Canada members – this training is supporting us to make the changes needed to reflect our diverse membership.